Our most recent #WENMentoring session saw our mentees learning about ‘Public Publicity’ and inevitably public speaking. 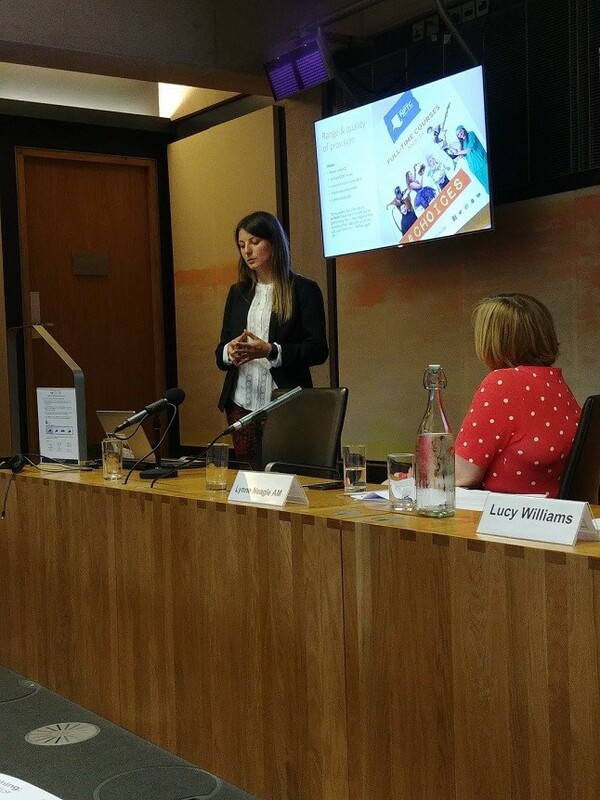 Lucy Williams describes her experience and how the session helped her deliver a presentation at the Senedd. This year we’ve seen and heard a lot about women, the women’s movement and women standing up and shouting out for what they believe in. Everyday we hear a lot about and a lot from incredibly influential and inspiring women. I am proud to be part of a network of incredible and inspiring women – the WEN mentoring programme. Last week we met up for our second training session on Public Publicity – which was all about public speaking and in all honesty, was the session I was dreading the most. I almost pulled out a few times, but as I was giving two presentations that same week, one in the Senedd, I knew I would benefit from the session. I am not afraid to admit that I fear public speaking, in all it’s forms, whether it’s a presentation, speech, or TV or radio interview. The mere thought of it makes me sick to my stomach. I watch other women and the way they conduct themselves in public and think “I wish I could be more like them”, assuming that no one else felt as terrified as me. Then I turned up to the training session and soon realised that, in fact, I was not the only one, and nearly all of the women in the room were just as nervous as me. I was surprised. I hold all of these amazing women in high regard, yet here we all were, sweating over having to do a mock debate and practice TV interview in front of the camera. Now, I can speculate as to why a group of confident, brilliant women, that without a doubt will become the future leaders of Wales were all so worked up about a bit of public speaking, but I won’t. Instead I’ll focus on how that day changed the way I think about public speaking. Throughout the day we heard from Eluned Morgan, Minister for Welsh Language and Lifelong Learning about how to prepare and conduct yourself when making a speech, Davina Payne from DaVina Media about talking to and engaging the media, and Kiki Farr from Hashtag Marketing about Social Media Use and Resilience. However, personally, the woman I took the most from was Sarah Dickins, BBC Cymru Wales’ first Economics Correspondent. She talked us through how to stand to remain grounded, how to project our voices, where to put our hands and so on. But what resonated with me was her telling us that she was a nervous public speaker and still gets nervous today, and that what calms her down the most, apart from grounding herself, and what was the most valuable piece of advice I took from the day was “don’t think about yourself, think about those you are fighting for”. This bounced around my head all day, all week and I think it will every day from now on. I also gained a lot of confidence from my fellow mentees. Knowing that I was not alone in my fear of public speaking, that many women, many influential women also feel the same, and have different ways of overcoming and coping with that fear. So with all of this in mind I went home and started preparing for my upcoming presentation that I was doing at the launch of a report I have written on the opportunities that exist for young people who do not have 5 A*-C GCSEs. I woke up on the morning of the presentation feeling sick with nerves, as I usually do when I know I’m public speaking, but I also had the new and almost unnatural feeling of confidence – I was going to fight for the young people I had worked with, and every young person in Wales that left school without 5 GCSEs. The presentation was a success, with positive feedback coming from both peers and colleagues. Statements included ‘hard hitting’, ‘direct’, ‘superb’ – comments which have never been associated with me and public speaking before. Because of the advice and confidence I have gained from the WEN training session, my fellow mentees and my mentor Dawn Bowden AM, who told me to push myself out of my comfort zone, I was able to stand up for those who’s voices are rarely heard, and I will take that forward with me to continue doing so for many years to come.